Located in award winning Halcyon complex. Open spacious split level floor plan w/2 master suites. Upgraded features include: recently installed granite counter tops in the kitchen and all bathrooms, hardwood flooring throughout, vaulted ceilings, skylights, new windows throughout with a lot of natural light, private patio, fireplace, new vanity/fixtures for all bathrooms, custom paint job recently completed, recently installed HVAC system, wood shutters, 2 car attached garage. 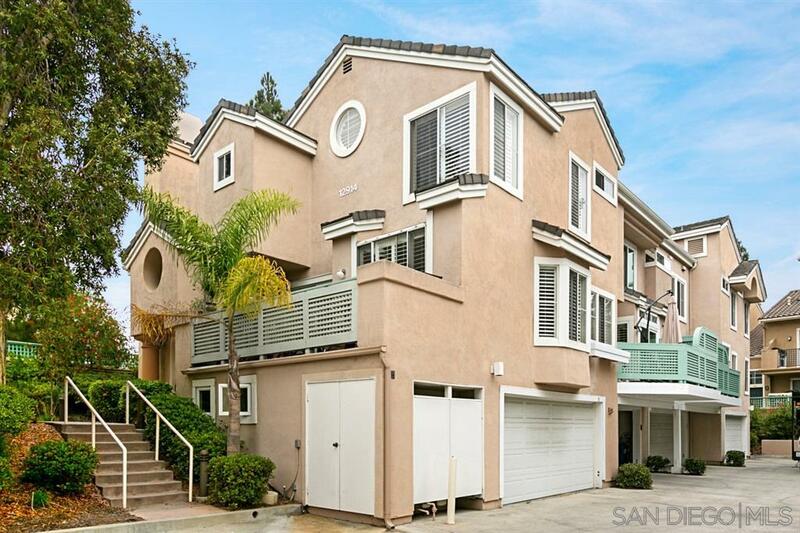 Refrig/W/D included., Upgraded multi-level townhome located in the desired community of Carmel Valley on Carmel Creek Rd. with walkable amenities to include Del Mar Highlands retail center (Cinepolis, Sear Sucker, Starbucks, Ralphs etc. ), and One Paseo (new shopping center – under construction). Located across the street from Carmel elementary school, close proximity to many other desired elementary/middle schools and UCSD. Location provides direct access to the I-5 freeway via Del Mar Heights Rd. and the 56 Freeway.